Try before you buy? We have so much confidence that you will love our Binding Machines, that we are offering a completely free, no obligation Demo to all our customers in the London area. For lower level users who want to bind in a variety of styles, including the new Image Strips. Whether you own a small company that is looking for a low-cost method of binding documents, or you work for a large corporation that wants a way to brand its work, the Fastback® 9 binding machine is an excellent choice for all your binding needs. Like its predecessor—the Fastback® 8x—the Fastback 9 can bind a variety of documents, from tape-bound reports, to hard cover books. You can even make paperback books using the Perfectback-Lx PS and LF strips. Best of all is the ability to create your own unique binding strips called Image Strips. Even the plainest black-and-white document becomes something special when bound with an Image Strip. Use the Lx-Strips, to bind any document quickly and effectively. Lx-Strips are available in eleven colors (Black, Dark Gray, White, Dark Blue, Bright Blue, Purple, Jade Green, Dark Green, Red, Maroon, and Yellow). Add the Fastback Hardcover Guide and you can produce hard cover books with the same strips and Fastback Hardcovers. Its desktop footprint (330mm × 495mm) is small enough to fit the most cramped conditions. The Fastback® 9 also works in concert with the Foilfast printer to add foil printing to your document covers. Perfectback strips, Halfback covers, Bindercovers and Clear Covers are all compatible with the Fastback 9. High volume, fast binder designed and engineered to meet the demands of professional binderies, quick printers, busy offices and more. The Model 20 has six distinct binding styles – Standard Superstrip, Composition strip, Perfectback, Halfback, Hardcover, and now the Image Strip. 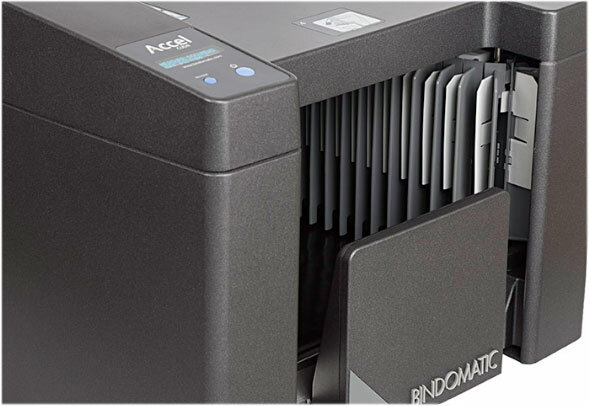 The BINDOMATIC 1000 is a small and manually operated thermal binder designed mainly for personal use, yet producing the same professionally bound documents as the more advanced thermal binders. The BINDOMATIC 5000 The Bindomatic® 5000 is a powerful, manually operated binder designed to meet any document format demand with spine lengths up to 370 mm. Bind documents as thick as 54 mm, soft covers, hard covers; this binder will bind them all and do it stronger and more effectively than any comparable manual binding system on the market, around 10 documents per minute. Bindomatic has enhanced our Drop&Go Technology, making the Accel Cube an amazing two times faster than the previous generation. Its efficiency is rivaled only by the Bindomatic® Ultra. Documents move through the machine twice as fast, dramatically boosting efficiency. The Cube features additional upgrades including increased quality and strength of the bound documents as well as improved appearance of the machine. Successor to the 7000, the Cube is the ideal binding solution for office/corporate walk-up print stations, as well as volume demanding CRD or commercial print environments. It delivers professionally-bound documents, without the need of trained operators.